The IJ is available by home delivery in West Marin, just as it is in the rest of the county. The IJ is not a “supplement” to the Chronicle and never has been. The same delivery force handles the Chronicle and the IJ to avoid having two carriers in two cars driving essentially the same routes in the county. Subscribers do not have to take another paper to get the IJ delivered to their homes. 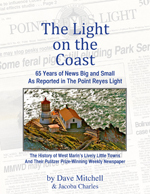 The IJ did halt single copy sales in West Marin because we were losing money. I was sorry to read about your subscription refund problems. I have passed them along to our circulation department.